A week ago, my little girl turned the big 4! Beth, her dad and I went out to our favourite restaurant for dinner. She really enjoyed it. I had asked her what she wanted to do for her birthday and her reply was for the museum, library and a restaurant for dinner. The county museum isn't exactly huge but she loves it. Three levels are stationary and the top floor has temporary exhibits. The one at the moment has personal accounts from people living in Northern Ireland in the wake of the Troubles. Of course, Beth wanted to know what it was all about but I just gave a description in general terms. Four is not the age to learn about all that! On Saturday, we threw a party for all Beth's friends (not the school ones yet). It was a Peter Pan themed party with an Indian camp outside (tee-pees), pirates in the kitchen and fairies all over the place. Beth was dressed as a mermaid. First, it was Wendy, then Tinkerbell but finally, she settled on a mermaid. I made the costume and I think it turned out ok (after a rocky, bad sewing, start). There were thirteen kids and seventeen adults. I think the highlight was the crocodile pinata. Everyone had great fun beating it!! Took six hours to bake and ice the cake but it was yummy! I made the little Peter, Wendy, John and Michael cut outs for the top of the cake. The cake. Wasn't a rainbow cake, just red and blue layers. I'm actually starting to have dreams about taking Beth into school late and the teacher giving out to me! She's a lovely woman so it's nothing to do with her, just all in my head. I was a terrible student in the last few years of secondary school. I rarely made it for 9am, sometimes not even by 10am! I'm not a great believer in formal education though, I guess I didn't know at the time why I had such an aversion to school. However, looking back now I can understand why I did the things I did. Some of it was to get attention but mostly it was to do with what I was learning. During English class, while Ms. Rocks expounded details on Yeats and Kinsella, I read the rest of the Soundings (English poetry book in Ireland in the 1990's). I loved the American poets like T.S. Elliot and other poems she passed over, like Shakespeare's sonnets. I didn't want to stick to the regimented Leaving Cert. requirements but, of course, that's not how you get high points to get into college. When I got my results (just scraped a pass) everyone thought I would go back and repeat, get better grades and go on to college. I did get into college anyway as I was doing all higher level subjects, even my bad grades were worth some points! I couldn't go back to another year, it wasn't for me, I had to move on. I loved primary school though and hope Beth will too. It's a little different to 28 years ago when I started. For one, I got hit by the teacher on my very first day! With a ruler! On my knuckles!! But I still loved it, loved learning so many new things. Even now, I love to learn new things. 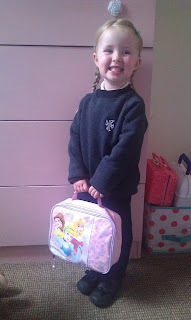 I know it is a bit late to be saying this but Beth started in her big school last Thursday! 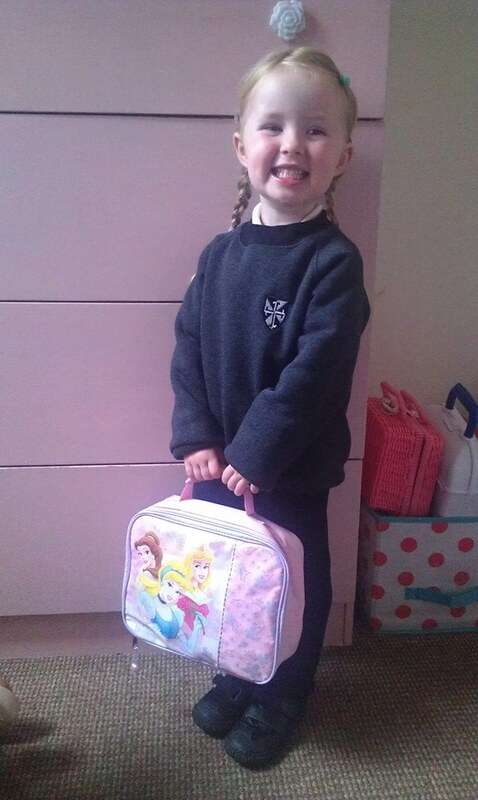 This is the first moment I've had to get on here to announce it :-) It is still technically pre-school but she has left her creche and is now in the school she will be attending until she is 11/12. She also has a little uniform! I was afraid I would be crying my eyes out, on the first morning, as she took little steps into a new big world. What I didn't expect was to be smiling from ear to ear as I walked away. Yes, I do feel a little sad. I feel sad because for, at least, the next thirteen years my little girl's life will be all about uniforms, packed lunches, schedules, tests, grades, P.E. (ugh!) and all that goes with school. Personally, I think our education system leaves a lot to be desired! If we lived close to a Steiner school she would be attending that instead! However, her school is said to be the best in town and we've had her name down for it since she was six months old! The reason I was smiling was simply because she is taking that step. She's growing up, gaining more independence. Beth will always be my little girl but she is her own person too. She needs to learn and meet new friends and I'm so excited for her. I'm also thankful she is capable of making this big step, my little girl is healthy as an ox and I'm so so thankful!! Nearly three and a half years ago, when I started this blog, Beth was only seven months old. In two weeks she will turn four! Everyone remarks how time is going so quick, but I don't like to think of it like that. I'm loving every stage that Beth has gone through and, even though she can be a right wee madam sometimes, I love this stage she's at right now. I don't like to think of the years as flying by. Today is a day of possibilities, as is tomorrow and every day that comes to greet us. The past was great, the future will be brilliant but what I love is right now, and making the most of it!